changes the direction of the inequality. A compound inequality is two simple inequalities joined by the word "and" or "or". • A solution to the compound inequality is a solution to both inequalities. • The compound inequality graph is the intersection of the graphs of the two inequalities. • "Intersection" is where the separate answers overlap. • A solution to the compound inequality is a solution to at least one of the inequalities. • The compound inequality graph is the union (joining together) of the graphs of the two inequalities. • "Union" is the combination of all the answers. Sandwich the common statement between the two inequalities. which can be read x > 2 and x < 7. The solution is x < 2 or x > 4. Since this problem is "and", graph where the solutions intersect with one another. Note: The solution x < 1 and x > -6 can also be written as -6 < x < 1. The graph will be the overlapping of the two separate graphs. Graph using an open circle for both -6 and 1 (x can not equal -6 nor 1) since our symbols are simply less than or greater than. Since this problem is "or", graph where both solutions are true. Graphing where both solutions are true covers the entire number line. Any number on the number line will make "one" or "both" of the inequaltites true. Since this problem is "and", graph where the two inequalities intersect -- where BOTH are true. Note: This problem can also be written as -2 < 2x - 1 < 5. When solving for x in this form, be sure to perform any changes to all three components of the inequality. • Add 1 to all three sections. • Divide all three sections by 2. The antifreeze added to your car's cooling system claims that it will protect your car to -35º C and 120º C. The coolant will remain in a liquid state as long as the temperature, in Celsius, satisfies the inequality -35º < C < 120º. Write this inequality in degrees Fahrenheit. The height of a horse is measured in a vertical line from the ground to the withers (at the base of the neck). Horses are measured in "hands" where one hand = 4 inches. If a horse is more than an exact number of hands high (hh), the extra inches are given after a decimal point, e.g. 14 hands 2 inches is written as 14.2 hh. Normal riding horses are between 14.3 hh and 17 hh, inclusive. Horses shorter than 14.3 hands are called ponies and horses over 17 hh are often called draft (or work) horses. a.) 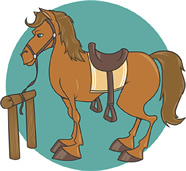 Write an inequality statement to represent the heights, h, of normal riding horses in inches. b.) Write an inequality statement stating the heights, in inches, of equines (horses) that do not fit the normal riding horse height specifications. 59" < h < 68"
Use conversions from part a.
h < 59" or h > 68"